As a General Services Contractor, Event Productions is always looking for new and responsible ways to minimize our impact on the economy. We believe that success not only comes the great work that you do, but it is the ability to minimize the effect on the environment while maintaining excellent results.Looking to go green with your next project? Check out our green options. Our warehouse in alameda, Califonia is a re-purposed historical building on a retired Naval Base. We are supporters of Alameda's Green programs and of Sun Cal, a developer hired for the Naval Base that is committed to advancing green building concepts. When the master plan for the base is finalized we hope that we will be here to stay and will continue the LEED application process. Alameda Power & Telecom:"More than 80% of Alameda's power is generated using renewable resources such as geothermal and hydroelectric facilities. That is just part of our commitment to environetal values. A community goal:"Being the lowest greenhouse-gas-emitting community in Alameda County and one of the lowest in the state!" We have re-lit the space with more energy efficient lights. We are recycling more of our waste, by donating computers, metal, and wood to the community. All of our rental items are housed locally, serving 90% of our market, which conserves fuel consumption unlike other national General Service Contractors who house their items in remote warehouses. 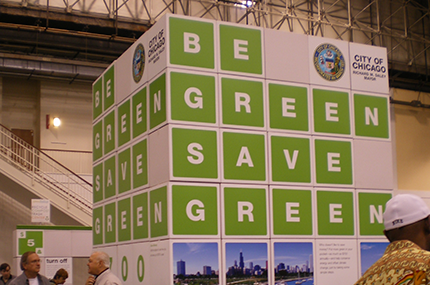 We offer 100% recycled substrates for our signage. When possible we use both sides of the signs that we produce, re-purpose after that for packing materials, or donate it to individuals in the community. Our existing carpet inventory is made from a minumum of 25% recycled materials, repaired/seemed to get the full life of the carpet. Future carpet purchases will be 100% recycled carpet and scraps will be recycled back into the carpet. Our employees regularly utilize public transit and promote carpooling. When applicable our office prints double-sided, utilizes 100% post consumer chlorine free paper, we seperate our paper from any non-recyclable trash in bins than deliver to a company who recycles the paper back into consumer products. We use Simple Green as our standard cleaning agent. Add recycle baskets to your booth or event for paper, bottles, and cans. Use biodegradable trash bags instead of using regular trash liners. Use linen tables as a green alternative to using draped tables with plastic tops. Place recycle stations throughout your event for attendees. Order carpet made from recycled materials to reduce waste in landfills.